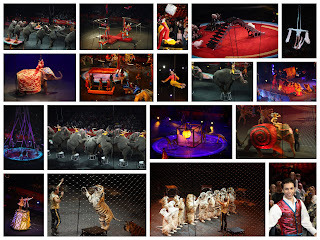 shelly's summary: The Greatest Show on Earth! Thursday night we went to the circus. We had a great time and the kids really enjoyed it. They both got very excited. Brylee's favorite part was the dancers and tight rope climbers and flippers. Jackson's favorite part was all the magic "tricks" they did. I was surprised at how well they liked it but they were very into it... makes me super excited about Disney! When are you going to Disney? We are planning to go back next year when Bentley is a little older.